Point Pleaasant starting pitcher Rylee Cochran, middle, receives some high-fives from teammates after a second inning strikeout Tuesday night in a non-conference softball contest against Ripley in Point Pleasant, W.Va.
POINT PLEASANT, W.Va. — Making the most of opportunities. 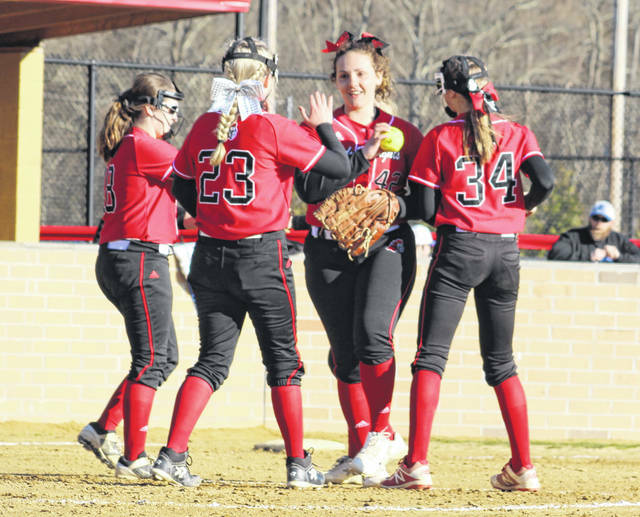 Visiting Ripley stranded runners in scoring position in five different innings, while the Point Pleasant softball team produced all of its runs with two outs Tuesday night during a 6-3 non-conference victory in Mason County. The host Lady Knights (2-1) scored at least one run in each of their first five innings at the plate as the Red and Black led 2-0 through two, 4-0 after three and were up 5-0 entering the top of the fifth. The Lady Vikings used a pair of errors and a groundout to manufacture their first score of the game, but Point Pleasant countered with Peyton Jordan sacrifice fly that allowed Amber Hatfield to score for a 6-1 edge after five complete. RHS left runners at the corners in the sixth and stranded a runner at second in the top half of the seventh, ultimately allowing Point to wrap up the three-run triumph. 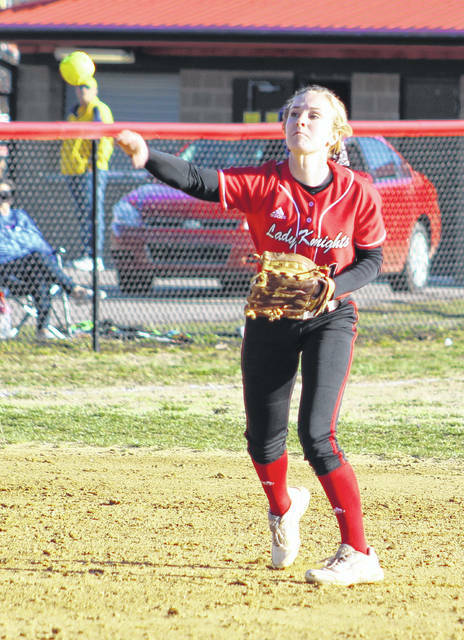 The Lady Knights also left multiple baserunners in scoring position in the first, second and fourth frames, as well as having runners stranded at second in the third and sixth innings. Overall, Ripley left 10 runners on base and PPHS had nine stranded on the bags. Point Pleasant outhit the guests by a 10-6 overall margin and also committed all two of the errors in the game. It was a victory that proved to be safe in its wire-to-wire fashion, but PPHS coach James Higginbotham noted that there is never a given in this game — especially when roughly 70 percent of your lineup comes from first-time varsity players. Then again, that was also one of the things that made this victory particularly special — especially this early in the season. Hayley Keefer gave Point a permanent lead after scoring on a bases-loaded walk to Rylee Cochran in the first, then Peyton Jordan scored on a two-out double by Tayah Fetty in the second for a 2-0 edge. Kit Stroud and Amber Hatfield scored from third and second, respectively, on a two-out double by nine-hole hitter Julia Parsons in the third, extending the lead out to 4-0. Haley Bryant scored in the fifth on a two-out double from Cochran for a five-run cushion. Point countered Ripley’s first run in the fifth with Jordan’s sacrifice fly for a 6-1 lead. Cochran was the winning pitcher of record after allowing two earned runs, six hits and four walks over seven innings while striking out six. Jaelyn Hunt took the loss after surrendering four earned runs, four hits and six walks over three frames while fanning three. Fetty, Stroud, Hatfield and Emma Harbour led PPHS with two hits apiece, followed by Cochran and Parsons with a safety each. Cochran and Parsons paced the hosts with two RBIs each, while Hatfield added a team-best two runs scored. Lainey Sholdis led the Lady Vikings with two hits, with Hunt, Cassidy Young, Victoria Hinzman and Jaden Conrad also providing a safety apiece. Hunt drove in two runs and also scored once. Point Pleasant was at Nitro Wednesday and returns to action Thursday when it hosts River Valley in a non-conference contest at 5:30 p.m. The junior varsity game will be played before the varsity contest.